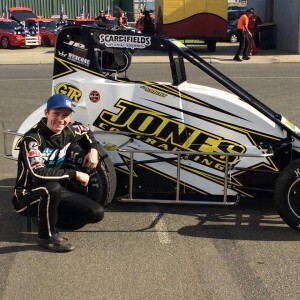 Michael Pickens is Australian Speedcar Champion | Talking Speedway, Speedway news from around the world! 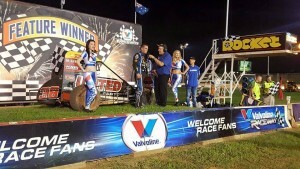 Valvoline Raceway: Michael Pickens packs the A1plate into his luggage and heads back home across the ditch with the most valuable and sought after prize in Australian Speedcar season .The Australian Championship will reside uncomfortably for many Speedcar fans in Auckland. 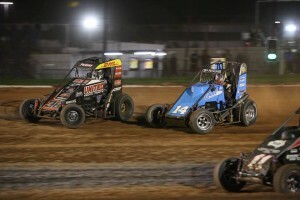 Whatever your view is on the International drivers competing in our National Title event there can be no question as to who has been the most outstanding driver cross all the international events both here in Australian and New Zealand . Six Americans and 3 of his fellow Kiwis and 45 of Australia’s best have not been able to take the legendary 6 Times New Zealand Champ down. Never far from the top of time sheets Pickens set the standard for others to match .Make no mistake this 40 lap Championship race had plenty of challengers for Pickens to overcome. The defending Champion Adam Clarke returned to top form during the race and at times looked likely to get his hat trick of successive wins but tyre problems and the furious pace on the top by Felker and Pickens saw the Aussie No1 looking to get the best possible finish . . The race was a stunner, no need for wings here but the determination and commitment at the front had the big crowd on their feet as the top four exchanged slides and traded positions. For me the biggest surprise in the earlier Internationals and in the Championship Feature was the performance of Andrew Felker, he has been amazing. The final laps of the race and it was impossible to predict the race winner and as it should be at all great Championships the winner emerged in the form of Pickens beating Felker by the smallest margin .With Clarke running the bottom trying to keep his tyres in shape Alex Bright drove around the outside to grab the final podium spot just ahead of the defending Champion. 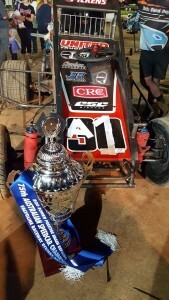 This entry was posted in Australian Speedcar Championship, Midget Speedcars by admin. Bookmark the permalink.